If there is one thing my kids taught me over the years, it's to be prepared for anything and EVERYTHING! Always be prepared is my motto. I try to think of every possible scenario and plan accordingly. Even if you don't think something will happen, it probably will if you have kids! We are just days away from Summer Break. Dylan and Lexie are excited and I'm right there with them! We're all looking forward to a more relaxed Summer schedule. We will still be very much on the go, though. 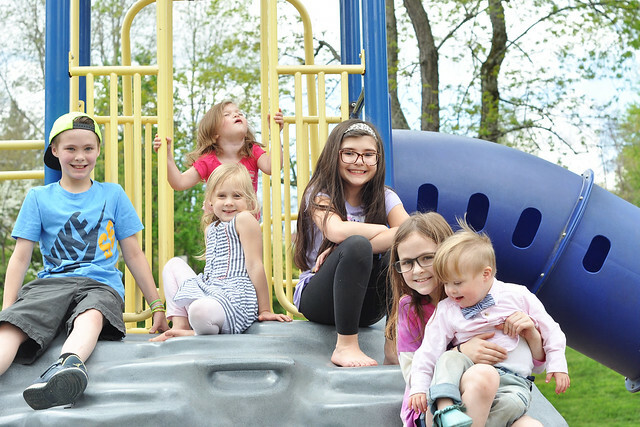 And there will be 1-3 extra kids with us almost every day of the week! We spend a lot of time at all of our local parks over the summer. We often have spontaneous playground visits while we're out and about, so I need to be prepared with snacks, sunscreen and toys at all times! 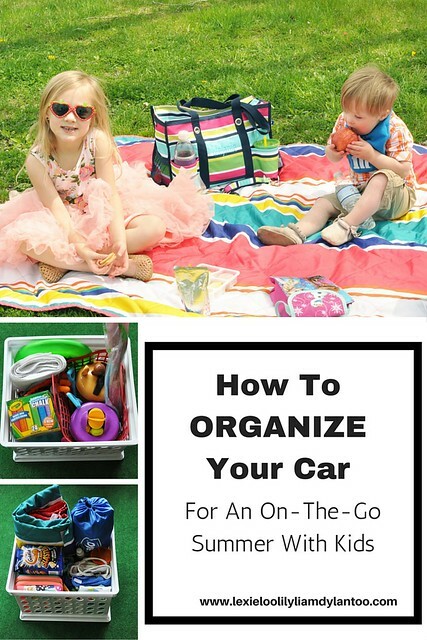 I learned several years ago to keep my SUV stocked with all those on-the-go necessities. I have two plastic crates that stack and I swap out the contents at the start of each season. I got a head start this year and already filled the crates with all the Summer essentials! 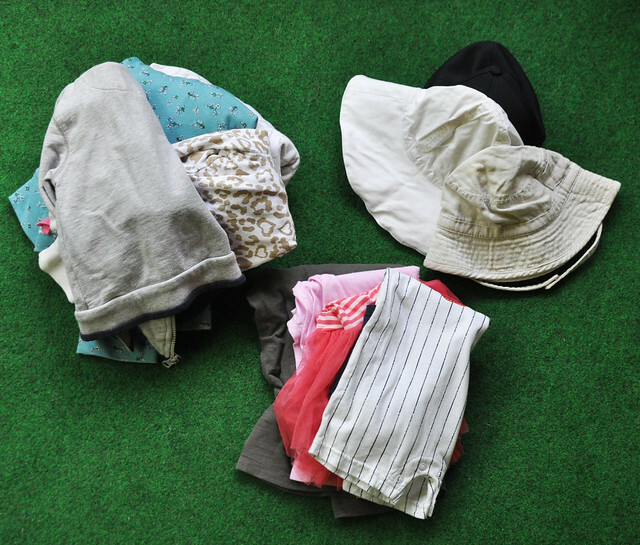 Step One: Hoodies, Hats and Extra Clothing! 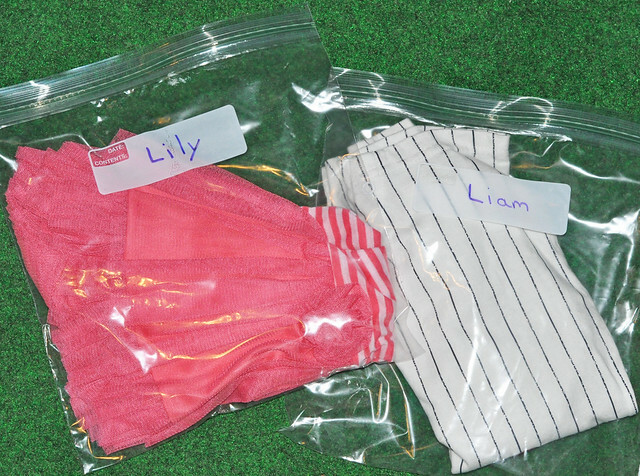 As for the extra clothing, I put each family member's clothing into a Ziploc bag, labeled with their name. 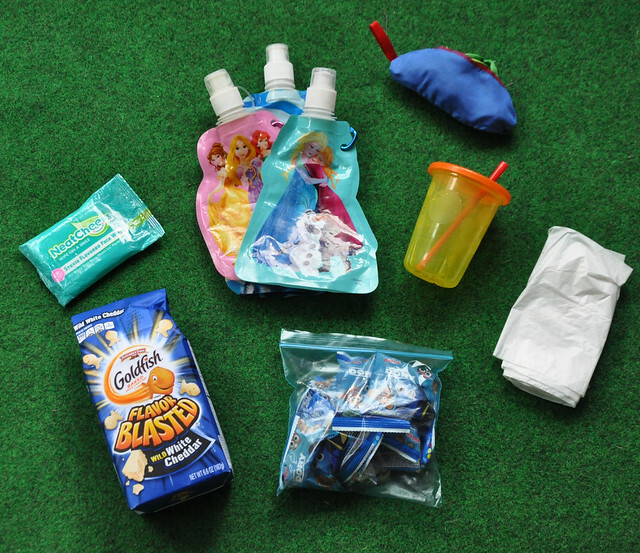 If they need the extra clothing, they can easily put their dirty/wet clothing back in the Ziploc bag. 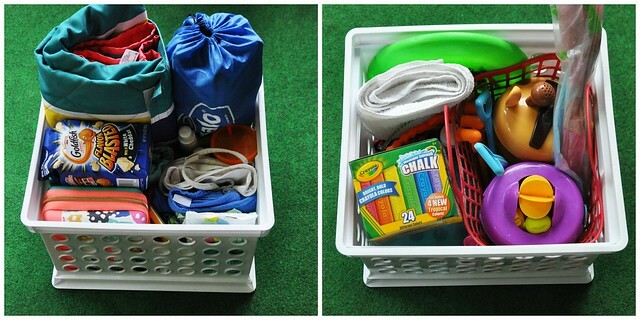 It's such an easy solution and helps contain messes! 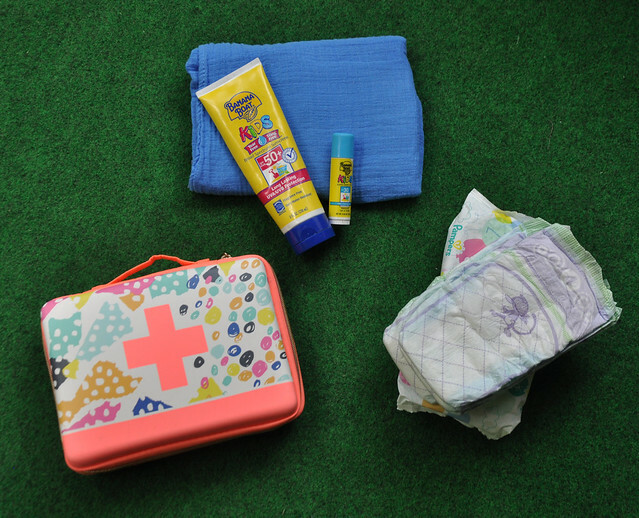 Our First Aid Kit is one of the most used items in our car! Bandaids solve everything, right?!? I also keep an extra bottle of sunscreen and a sunscreen face stick in a crate for touch-ups. Extra diapers, wipes (also used to clean hands and wipe down tables and tablecloths) and a multi-purpose blanket are other must-haves! 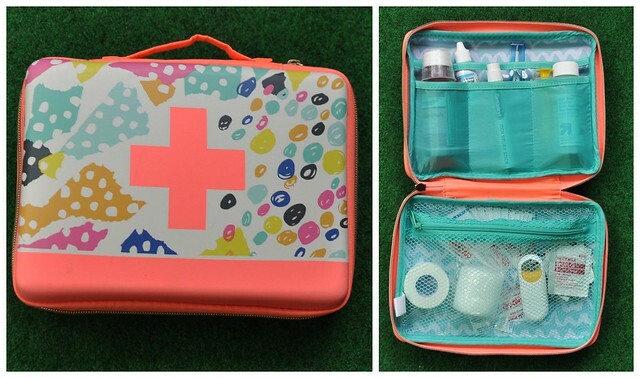 We replaced our First Aid Kit this year after I spotted a cute one at Target a few weeks ago. 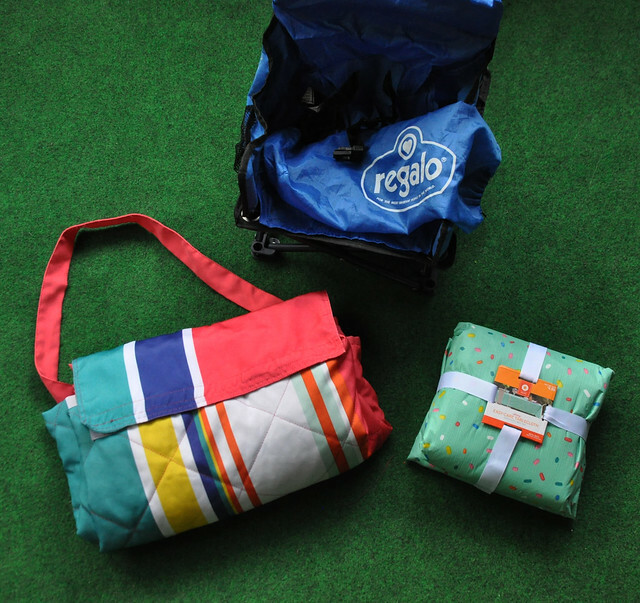 Just FYI, the sale is still ongoing: buy any 3 participating items and get the First Aid bag for free. SOLD! We use our picnic blanket all the time, but I like to keep an Easy Clean Tablecloth in my car just in case. Sometimes the kids want to sit at a picnic table and I don't have to wipe it down before they eat. Plus it doubles as an extra picnic blanket if we acquire extra kids! I can't find the one I had last year, so I replaced it this year. 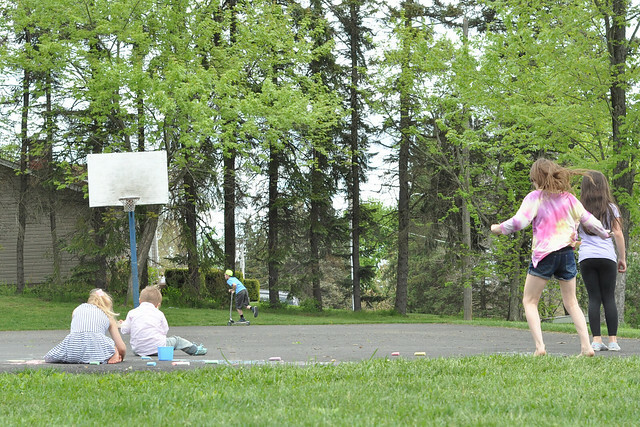 We plan on having a picnic once a week and prepare for it, but every time we stop at the park, my kids ask for a snack! I constantly refill our crate with crackers and fruit snacks. I toss in an easy-fold bib for Liam, NeatCheeks for quick and painless face wiping and a roll of small garbage bags to clean up messes. We have a fridge in our garage so I make sure each kid grabs a drink before they get into the car. I do keep reusable water pouches and a straw cup for Liam in the crates so they can fill them with water from a fountain as needed. 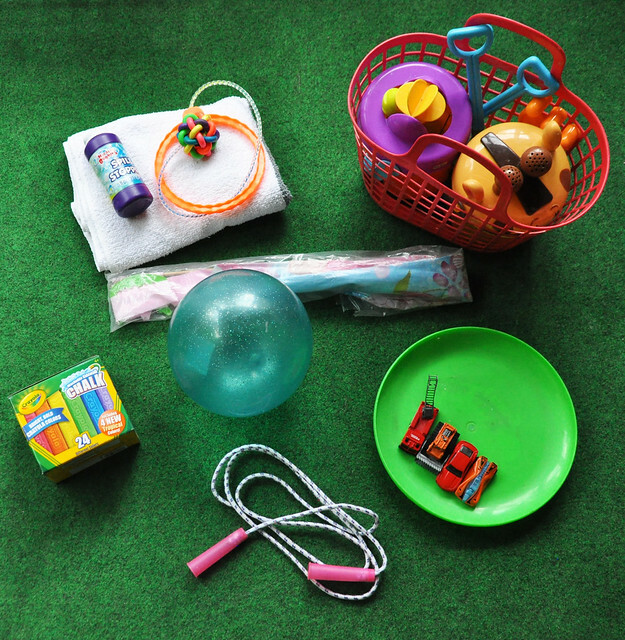 The kids like to bring their bikes/scooters/skateboards/basketballs to the park if we plan ahead of time, but if not, I've got it covered with a few simple and inexpensive playground toys! Step 6: Pack It Up! Any kind of storage bin would work, but I prefer these $3.49 stackable crates from Target! I can sit them side by side or stack them. If I need to take them out of my SUV, I can move them while they're connected and sit them in the corner of my garage. Most cars these days have little storage compartments throughout them. I utilize every space in my SUV! There's a sunken storage compartment in the cargo area where I store all the hoodies, extra clothes, the Ergo, the shopping cart cover and the extra toys, diapers, snacks and wipes. It's not the most organized space, but that's because we're grabbing stuff out of there all the time! 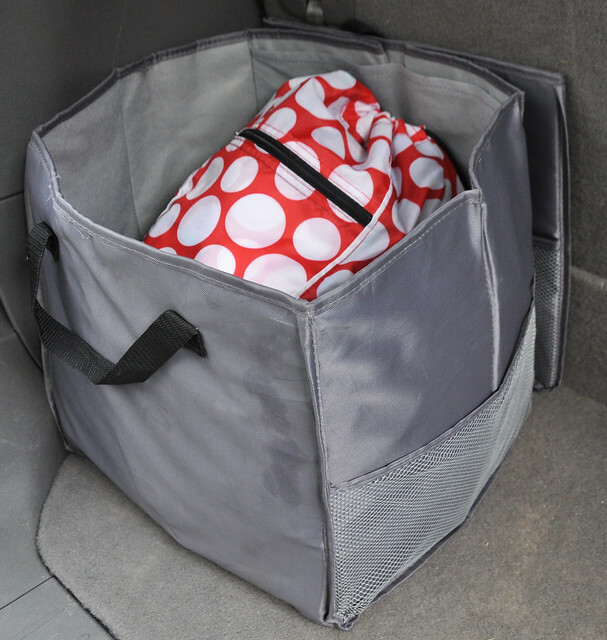 I keep an expandable tote (from TJ Maxx) in the cargo area to catch all the loose items. Right now, it contains a blanket, our restaurant bag and an umbrella. 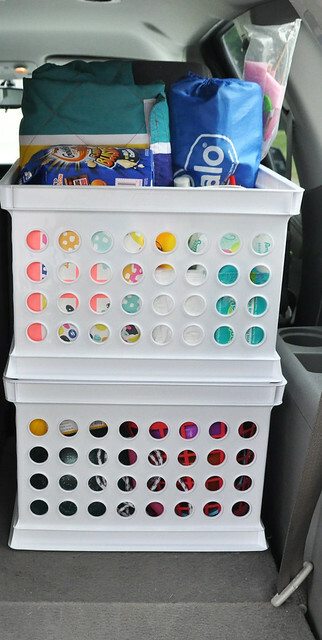 I usually place those items aside and pop it open after I go shopping and place shopping bags in it. When I get home, I carry the entire thing into the house filled with bags! 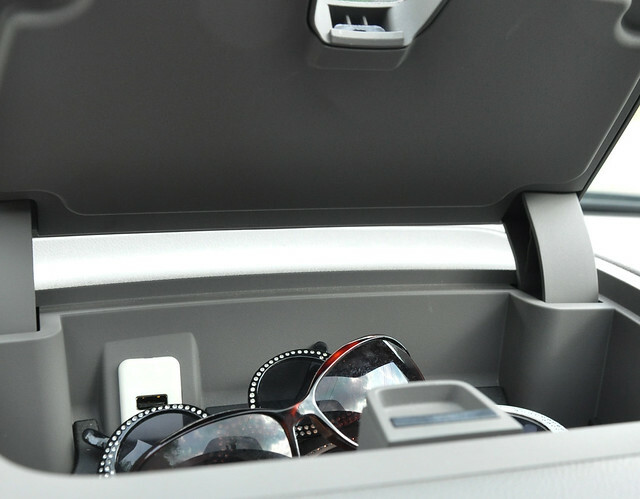 I have a compartment that holds an extra pair of sunglasses for each family member. That has come in handy many times! 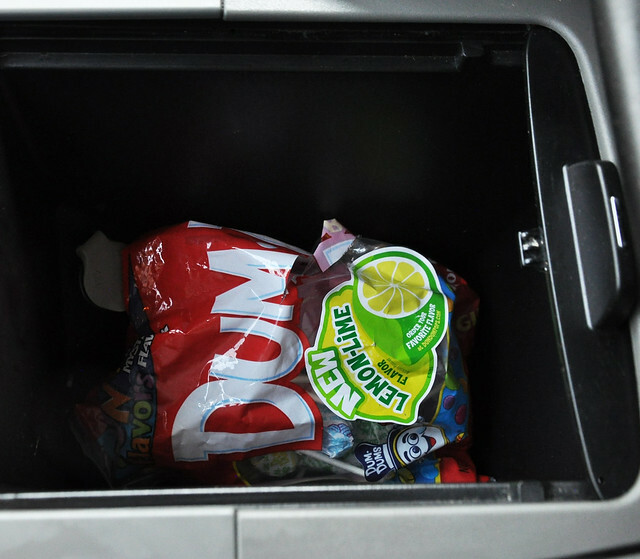 There's also a compartment in between the driver's seat and passenger seat filled with my secret weapon: LOLLIPOPS! I toss them back to the kids as needed! 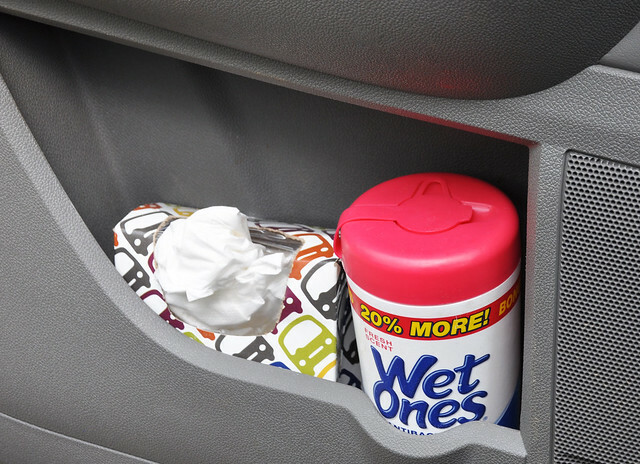 Finally, in the compartment in the driver's side door, I keep kleenex, wet wipes and hand santizer within reach at all times. Because kids can be gross. Just saying. What do you keep in your car at all times? Thank you! I had a feeling you're organized like me! You are so prepared! I love it! I need to get this going because we're in full on summer mode next week! That's exciting! I hope you have a great Summer break! This is awesome!!! You are so organized!! Great tips! We are so Summer ready over here!! I love this post! I am so bad about keeping stuff in the car. 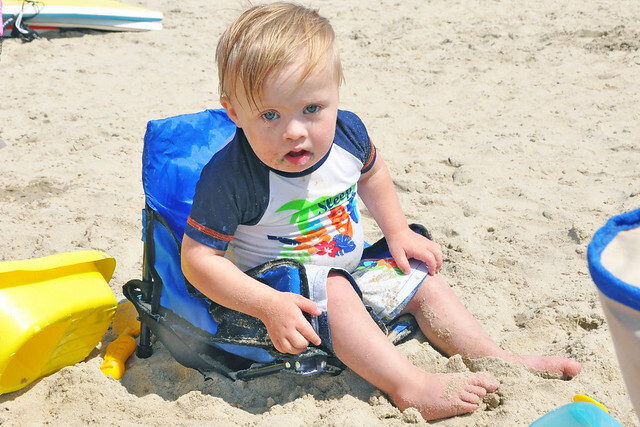 We still have a diaper bag that we bring everywhere for Olivia, but we don't ever bring changes of clothes for either kid. I really need to be better about that!! Thank you! I've been caught without things we desperately needed too many times in the past, so I had to change that! Whoa you are so prepared. I need you to come help me get a little more prepared and organized :). Let's swap! I'll help with that and you can help me with your awesome mechanic skills! Great list of items. So many things that I never put in the car and I need too. We are going on a trip this weekend and I need to get some of this into my car asap. Thank you! I hope you have a wonderful trip! You are so smart & organized! You're the type of friend I need, because I can let my guard down & now you have me covered! Of course if we needed extra clothes, my four year old boy would be wearing your daughter's clothes & my two year old girl would be wearing boy clothes, but that would be ok!! Great ideas! And I love your 31 bag! Preppy pop is such a fun pattern for summer! Thank you! I love that pattern, too! Thank you so much! Just trying to be prepared! Okay this is all genius. I need to do this!! You definitely should! Who would have ever thought I would need a full first aid kit on day two of summer break?! ?